I hate being asked what my favourite movies are. There’s just too many for me to work out any kind of answer. Songs on the other hand… well it’s still tricky because I have massive fads when it comes to music. But there are several songs I found myself returning to over and over again and I still love them, they move me, inspire me, or just put me into a kind of happy music trance. I love so many other songs by these same artists, and so many other songs as well. But for now, these are the ones. My lovely and adorable friend Alice recently moved to London and she posted this photo today, of a building she goes past on her way to work. She said the giant neon green ‘FEELINGS’ sign reminded me of her, and I’m pretty happy about that. New music. Not necessarily new music, but new to me. Today I enlisted the help of friends on Twitter and Facebook and created a new playlist with suggestions from them. I’m happy with it. A read a really, really good article about being happy. Honourable Mentions: Pizza, giving out my business cards, alcoholic ginger beer, flat Lego Rock Band sessions, new craft projects, tidying and cleaning (maybe less the act and more the outcome). I just wore my prescription sunglasses for the first time on my drive home and they were awesome and comfortable, I love them. 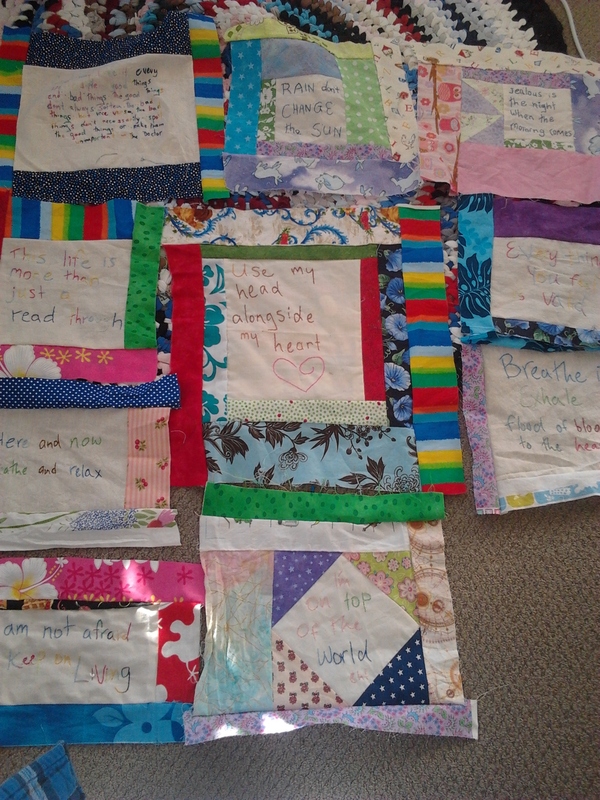 Well, my affirmations are all completed and today I spent a couple of hours assembling them all into a quilt. When I was thinking about how to border it I remembered that I had a stack of charm squares from a previous fabric order many months ago. So I made them into a border and there were exactly enough to go right around the quilt with nothing left over. Must have been meant to be! 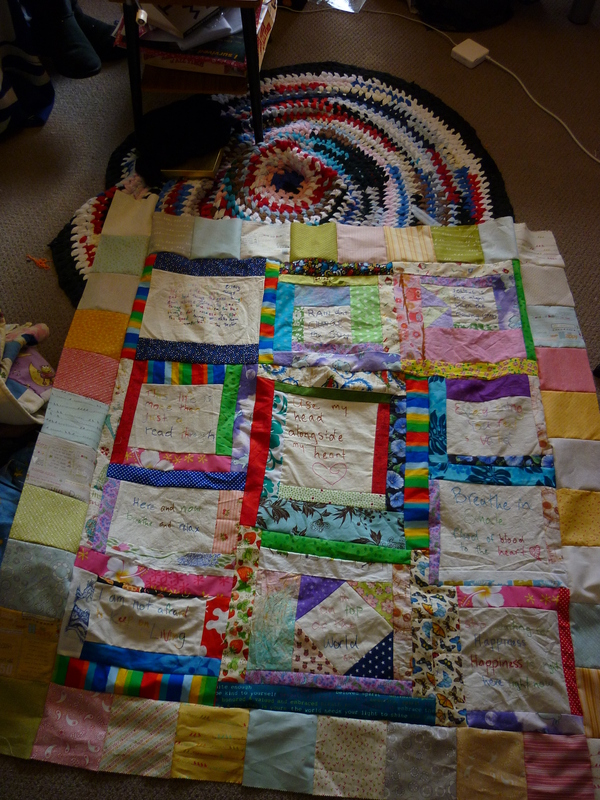 My quilt is bright and colourful and full of love, and I’m very happy with it. This week I’ll put it together with batting and backing and it shouldn’t take too long to quilt and then I can hang it on the wall above my bed! sorry I’ve been busy this evening and wasn’t able to get much out for this. Rock Band! Now that there is more space in the lounge, I have rediscovered Rock Band. Ellen, Blair and I made a Lego Rock Band called Night Vale Interns and so far we’re doing very well, Ellen has taken to the drums like a duck to water. I have really awesome Flatmates. Honourable Mentions: Lovely online friends, lovely real life friends, reading excellent books (Joyland by Stpehen King), chocolate, stickers, delicious burgers, warm shirts, sweater vests, Welcome to Night Vale fanart, organising things, new shelves and warm feet. I’ve been doing little things, cross stitch mostly… I’ve been embroidering as well, making affirmations which I make into patches. I only need one more and then I can put together the quilt top and add some borders. It’s been a while since I made a quilt for me, and I have just the space for this one over my bed. 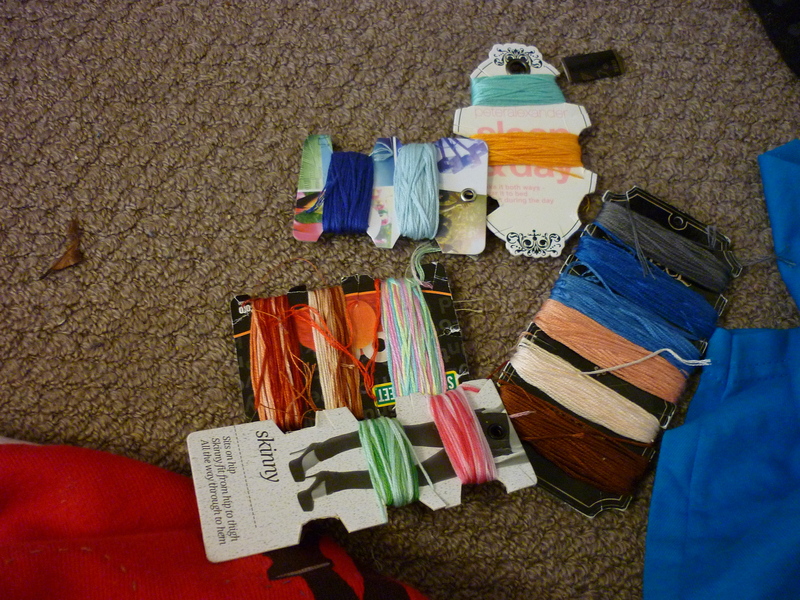 Also, and this doesn’t count so much as crafting as it does as craft organisation, but I think it looks neat. You know those little pastic thingies you can buy to wind embroidery thread on? I’ve been hacking wedges out of sturdy cardboard clothing tags and using those instead. Some of them are really pretty! Spring cleaning. It’s therapeutic, it leaves you with a tidier and decluttered house and things look pretty when they’re clean. Lovely wonderful friends who give hugs and show you things you’ll like, make jokes, make dinner. My friends are good people. I love them. I like that my friends are getting into Welcome to Night Vale so that I can share the wonder with them. Re-listening to it in the car commute is pretty damn fun too. Honourable Mentions: rewatching Community and X-Files, tacos Thursday, tacos from the wee hole in the wall place on the waterfront, crafts, new t shirts, skinny jeans, going to the cinema to watch movies and playing with my kaiju. Throwaway comment today from the lovely Caitlin in relation to a dream I had last night… she said she wanted to go to an amusement park based on my brain. I kind of like the idea of mapping out your brain in the manner of an amusement park. I may try and draw a map or something, but for now a little self reflection. Based on my dream this morning, the shopping section of the Jenni’s Mind park would be decorated with sparkly fish kites and there’d be people dressed in sequinned fish person costumes advertising the shops and drawing people in. There would be lots of movie and TV themed attractions, but.. that kind of thing’s already covered in existing amusement parks. Suffice to say, if I was building this tomorrow, there’d be Pacific Rim and Welcome to Night Vale districts. Monsters, lots of strange and cuddly monsters and fae, vampires and werewolves, giant monsters and giant skarks and weird stuff going on. T Rexes, dinosaurs. Maybe a Jurassic Park style boat ride where you go past dinosaurs, that would be cool. Some kind of emo teen supernatural romance themed section of the park. People could sit around in cafes and moon at each other, or go to the beach and stare moodily into the middle distance. But the overall theme of the whole park would be love. I try very hard to frame my interactions to people with love, and it would make sense that the whole park would encourage people to feel good about themselves, and to treat other people well. There would be quotes on pavers in the footpath, like in Jack Kerouac Lane in San Francisco, places where you can connect with strangers like this and places to make collaborate art and crafts. Heh, funny little exercise but interesting challenge to my self perception.